We wanted a wine with a massive personality, and maximum impact. Can’t go wrong then choosing a California Cabernet Sauvignon with a name inspired by “Ziggy Stardust” and “Stairway to Heaven”. 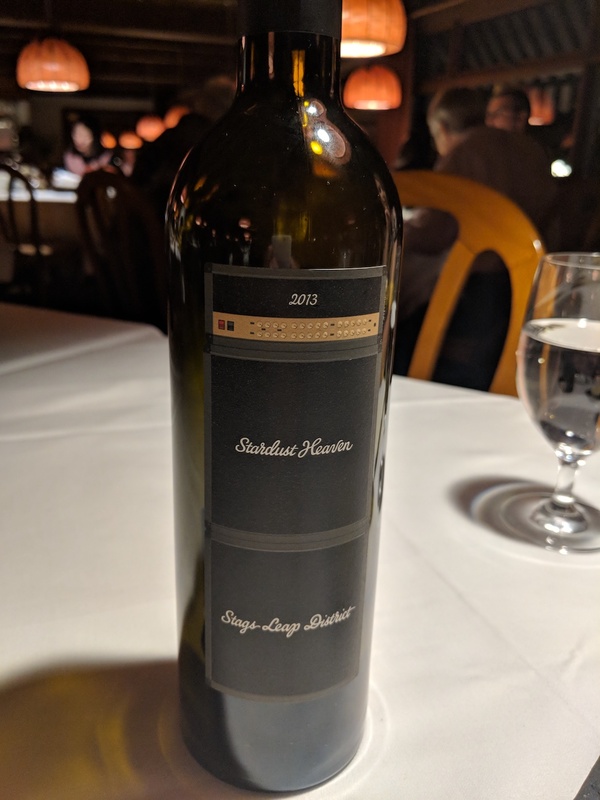 Selected from the Post Hotel’s renowned wine cellar, this bottle of 2013 Stardust Heaven was a great way to toast the last evening of our Rocky Mountain holiday, and a great (if sometimes quirky) companion for the Tasting Menu in which we decided to indulge. 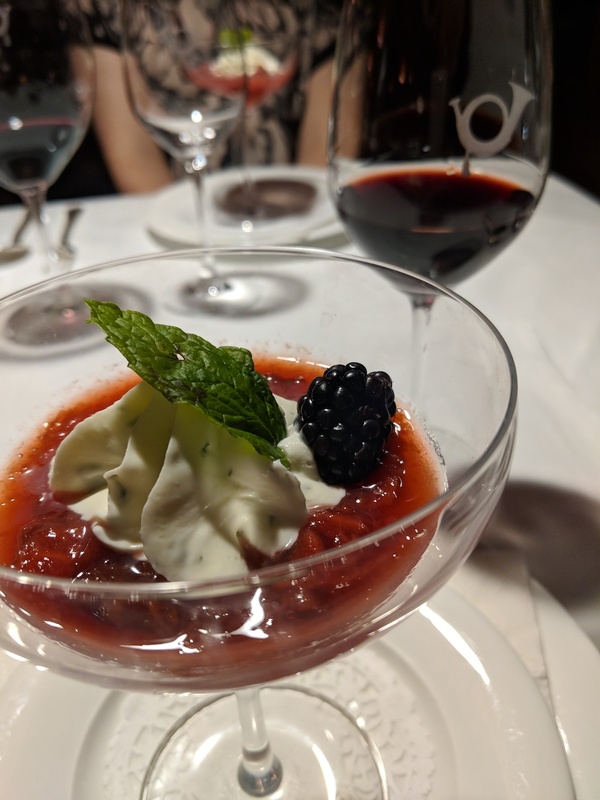 If you’re not going to do a wine pairing experience, there will always be moments when food and wine clash just a little – so you might as well do as we did and make it a standout wine in its own right. The 2013 Cliff Lede Stardust Heaven is just that – a standout characterized by an inky purple colour (for rock royalty? ), bold blackberry and dark berry flavors, as well as earthy licorice notes. And you’ve just got to love the spirit and the story behind it, and all the Cliff Lede “Rock Blocks” wines – the various vineyard blocks are named after class rock tunes by The Who, Pink Floyd, and in the case of our bottle here, Bowie and Zeppelin. Last day of vacation, so we went out with a bang, knowing we were in for the Post’s generous portions and intriguing flavors. We’ve sampled several tasting menus crafted by Chef Hans Sauter in the past – this was one of our favourites. 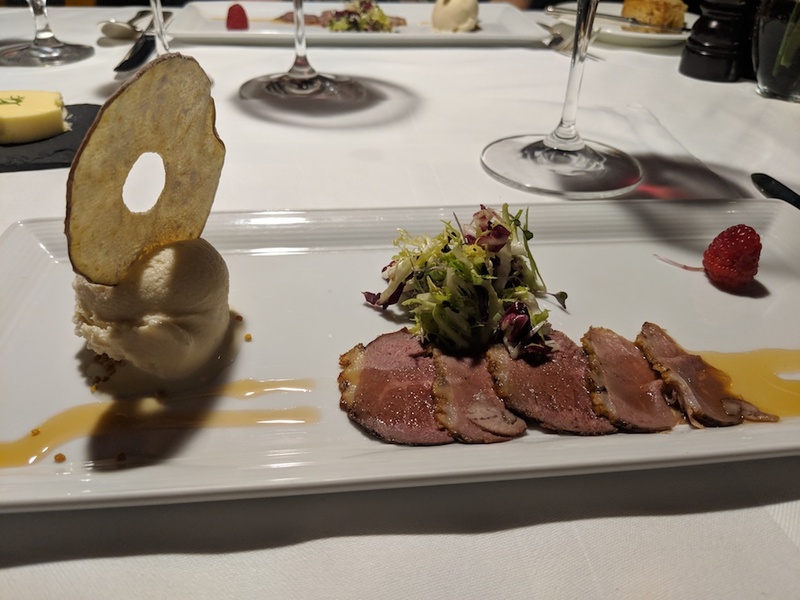 Delicate slices of smoked duck breast served with a whiskey ice cream began the feast. It looked gorgeous and the duck was perfect. The ice cream was not perhaps my favourite, but I could appreciate the composition of flavors with the whiskey being a nice match for the smoked meat. The prawns on the other hand look fairly simple, but the dish was a standout – really, really delicious. 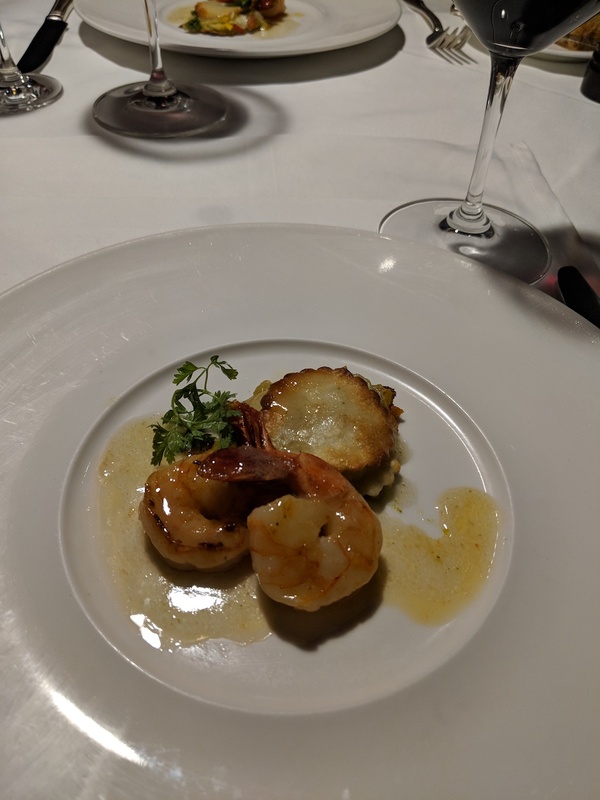 Tender and meaty, the prawns’ terrific flavor was beautifully enhanced by the thyme vinaigrette. And the tender, toasty quesadilla with creamy avocado made the dish complete. Easily our favourite course! 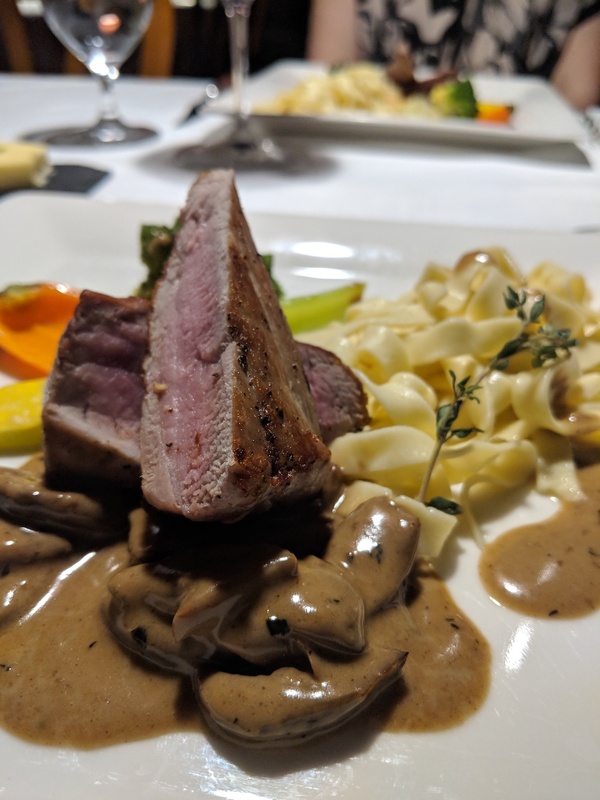 The main course was the pork tenderloin and tagliatelle with a rich and creamy porcini mushroom sauce. This is a plate to satisfy a cold-weather craving. I consider this dish “vintage Post Hotel” with its hearty sauce and tender, buttery homemade noodles. While this particular pork tenderloin and tagliatelle dish doesn’t generally appear on the menu, if you’re looking for something similar choose either the veal tenderloin with creamy morel sauce on homemade Spinach fettuccini, or the beef tenderloin “stroganoff” with homemade egg tagliatelle (both dishes have been regular features at the Post for years – with good cause). 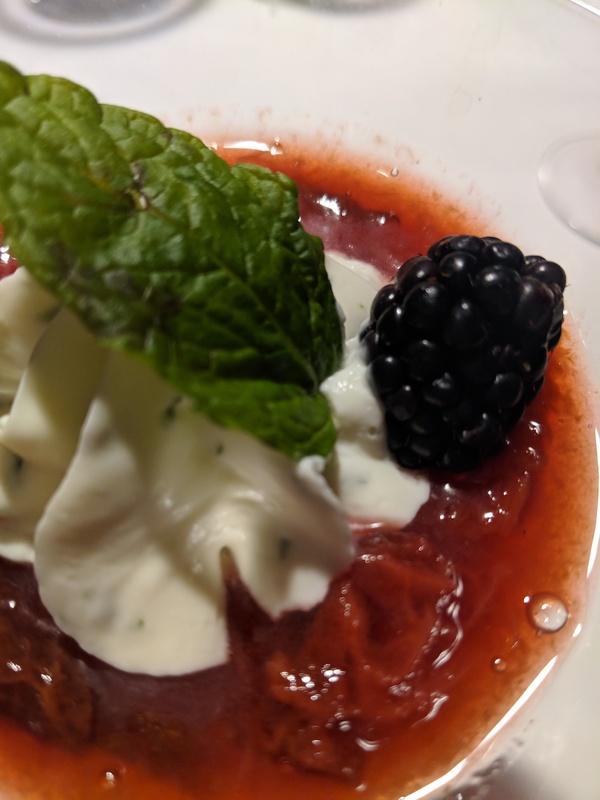 This dish – the Goat Cheese Mousseline with Plum Compote – was an unexpected treat. A tangy, creamy, savory dollop of cheese mixed and melded gorgeously with a deeply-flavored plum compote. If I hadn’t been so full, and if there wasn’t an actual dessert course to come, I would have had two. Delish! Yes, there was dessert – a rich, moist carrot cake thickly laden with cream cheese icing (the reason to eat carrot cake?) – and this is the second time in recent posts that I’ve neglected to grab a photo. My reason is a pretty good one, I think. 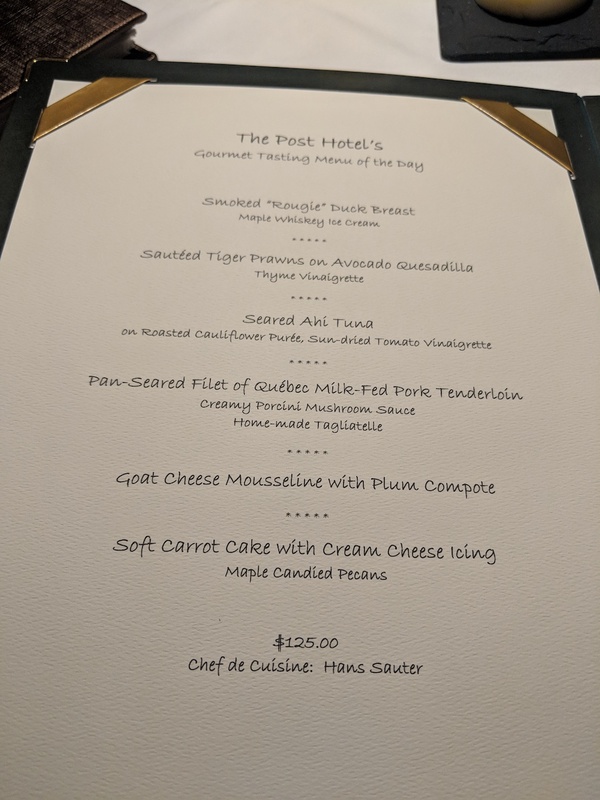 It was basically the last evening the Post Hotel’s dining room would be open before the five-week closure between Canadian Thanksgiving and ski season. We noticed another couple- fellow port aficionados- nearby. It seemed natural to pull our chairs together, and toast a beautiful meal in a beautiful place together. So, no photo, but great conversation. A massive wine, a tasty, multi-course feast and lovely new friends – great end to a great vacation! This was a rare find, so CARPE DIEM! Incredibly big and bold, this deep, richly coloured red wine was over the top and wonderful for it. We ordered this fine, rich bottle at Delmonico Steakhouse, celebrity chef Emeril Lagasse’s restaurant in the Venetian Hotel, Las Vegas. What an outstanding pairing for a classic steak dinner! Wine Spectator gives it 96 points, accurately describing it as “a remarkably rich and expressive young wine”. Highly recommended, if you can find it! Sitting under some of Picasso’s original artwork at the Picasso restaurant in the Bellagio Hotel, Las Vegas, it was hard not to feel generally in awe. However, we are quite sure that even in humbler surroundings, we would remain impressed by Chateau Lynch Bages 1990. This Bordeaux wine from the Pauillac region was sophisticated and refined, yet strikingly rich and full in taste.The colour was impressively deep, and even the nose was itself quite “delicious”! Wine Spectator gives this abundantly deserving wine an excellent score of 95. Parker, rates this wine an impressive 94. For those who love Bordeaux, this is a gorgeous choice.